This high-protein Egg and Tomato Tart will keep you going for hours after breakfast. 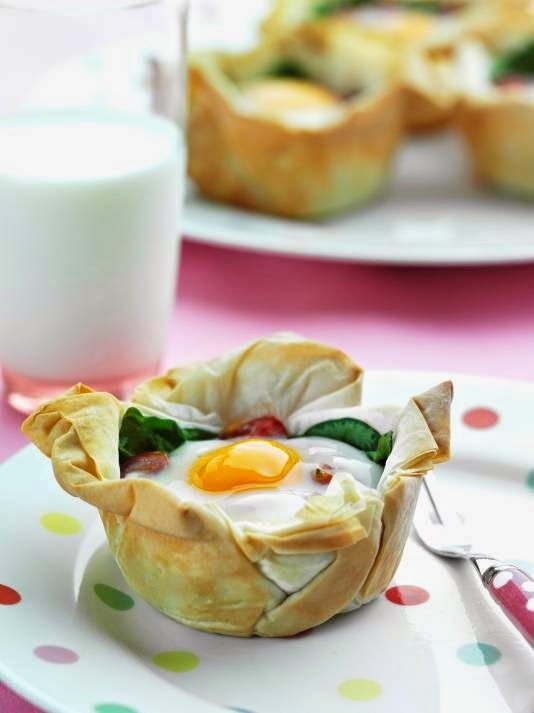 These tarts would also make a great starter for a dinner party, as well as a light lunch or snack throughout the day - they're so versatile! Preheat the oven to 180C. Lightly grease 6 large muffin cups. Spray a non-stick frying pan with oil and cook the bacon until lightly browned. Cool slightly. Lay out one sheet of filo and spray with oil. Fold into thirds crossways, then spray again. Fold in half to make a rough square. Place the pastry into one muffin tin. Repeat with remaining pastry. Line the pastry cases with spinach leaves, and place the tomatoes (cut side up) and bacon over the spinach. Carefully break an egg into each cup. Bake for 20 minutes, until the egg white has set. Lift from the tin, stand for 5 minutes, then serve with salad.